In 1951, Marcus Messner (Logan Lerman), a brilliant student from Newark, New Jersey, escapes being drafted into the Korean War when he receives a college scholarship. 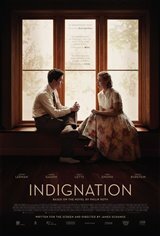 Not usually one to socialize or engage with girls, he develops a burgeoning infatuation with a beautiful classmate named Olivia Hutton (Sarah Gadon). However, it puts his future, and the plans his family has for him, in serious jeopardy. The college’s imposing Dean Hawes Caudwell (Tracy Letts) intervenes and Olivia's past struggles with mental health are revealed. But after a terrible accident transpires, Marcus may be in over his head. The film is based on the 2008 Philip Roth novel of the same name.